When we consider employee screening, many of us may think about simple background checks such as following up on employee references – but is this enough? 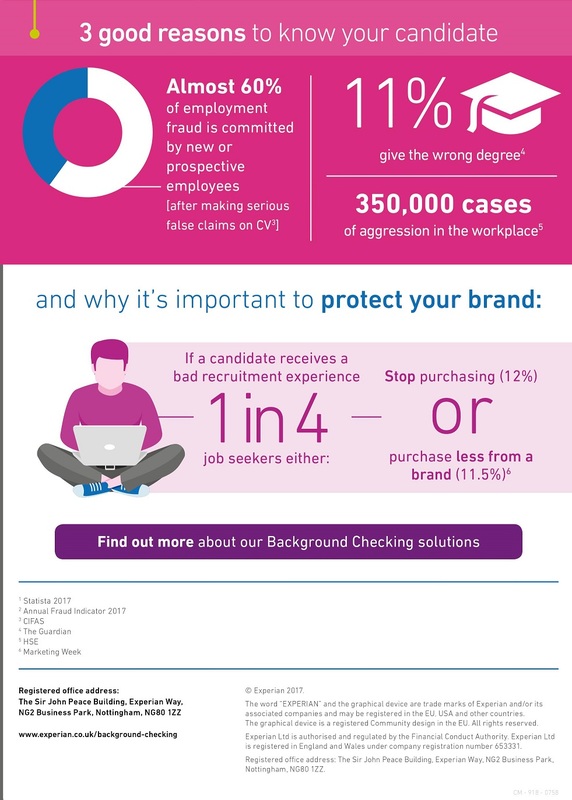 There are still many companies who don’t carry out any background checks during the recruitment process. This can lead to costly bad hires and internal fraud, which is a rising concern across the industry. This is demonstrated through research where CIFAS found from 2014 to 2015 there had been a 60 per cent increase in account fraud, where unauthorised activity is made by staff on a customer’s account¹. In addition to this, according to The Recruitment & Employment Confederation a poor hire at mid-manager level with a salary of £42,000 can cost a business more than £132,000². So, when it comes to employee screening, how do you know you’re doing it well? Are you doing it to tick a box or do you truly understand the people you’re employing? Depending on the sector in which you work; the level and type of role you’re recruiting for; or even your own company policies; there may be a whole range of checks that you would benefit from to get the right employee first time around, whilst protecting your brand and its assets. When you invest so much time and money into recruiting new hires (on average it takes a month to find new candidates³ and the average cost of filling a vacancy is £6,125⁴), making sure you hire the right people for the role is crucial. Pre-employment screening is a great way to help you make the right choice, by giving you a deeper understanding of a candidate, if done appropriately. There’s also the candidate journey to consider. When you have lengthy, disjointed processes this can have a negative impact on the candidate’s first impression of your business. Therefore, when you do find the right candidate, you want to ensure that you present them with a positive experience, which is fast and requires minimal effort from the candidates’ perspective. With the right due diligence checks in place, you are more likely to hire the right people for the right role, reduce your exposure to risk and maintain your brand reputation. Employing the right people for the level of responsibility involved in the role is essential. Checking qualifications and obtaining experience based references can help this. If you’re employing business leaders then Director Checks will consider previously held directorships, as well as any disqualifications on their record. If you are recruiting into regulated roles, then completing the correct screening checks is compulsory to be in line with regulation. For example, roles involving the selling or advising on investments such as pensions, life assurance policies, shares and collective investment schemes, would need an FCA check before they are authorised to conduct business in the financial sector. Screening efficiently from the point of job application can help you to identify the right people upfront. It gives you a deeper understanding than the legal requirements in isolation can provide. This includes checking their right to work, which if not completed can result in onboarding illegal workers and a £20,000 fine per employee⁵. So what does a good candidate experience look like, pre and post job offer? Vetting checks allow you as an employer to have greater confidence in your hiring decisions whilst mitigating potential risk and saving you money. It ensures you are recruiting and retaining the contributing employees you’re looking for. You can select the checks that are the most relevant to the role and industry as well as perform tailored checks for your business needs. Find out more about how you can get deeper expertise from our experienced team with our tailored Experian Background Checking solutions. Experian’s Right to Work App is a handy online tool that gives you peace of mind that your checks identify people who don’t have the right to work in the UK and are compliant with UK law.